Europe's economy may be struggling. But leading global companies headquartered in Europe pay solid dividends. In a world of diminutive interest rates, where can international investors find any kind of reasonable and secure income stream? Surprisingly, given the current political and economic backdrop, Europe may offer some opportunities. Europe may appear to be a region investors should ignore. Its current woes are well publicized and investors could be forgiven for asking 'Why do I need to bother?' This would be a consensus view, but when have investors made meaningful returns by blindly following the herd? A dispassionate analysis suggests that steering clear of Europe would be a mistake. So where should investors look? In our opinion, bonds may not be the best bet. The deteriorating fiscal position of many eurozone countries has led to a series of sovereign debt downgrades by credit rating agencies of France, Spain, Italy and most recently, the United Kingdom. And the yields in countries with the highest ratings, such as Germany and Switzerland, are tiny. German 10-year bunds offer less than 1.5% and Switzerland is barely paying 0.7%. Our research shows that corporate bonds look a little better. Several large companies within Europe retain higher debt ratings than the countries within which they reside. Equally important, European corporate bonds are currently yielding approximately 2.9%. But the investor shift into the corporate bond market is already well underway. The optimal entry point within European corporate debt markets has arguably passed. We think that's why investors should perhaps consider European stocks as a source of stable and growing income. Many of the largest companies in Europe are not dependent on strong European economic growth. Europe has a disproportionate share of world leaders in the luxury goods, autos, engineering and pharmaceuticals sectors. Related: McBoring stocks rule, but for how long? Companies such as BMW, Nestle (NSRGY), Siemens (SI), Rolls-Royce (RYCEF) and LVMH (LVMUY) are all headquartered in Europe, occupy leading positions within their sectors yet derive a large part of their earnings from outside their domestic markets. Arguably, strong GDP growth in Asia is a more important driver of global profitability for LVMH than is the impact of continued 'austerity' in Europe. So while Europe is potentially a safer place to invest than investors had thought, how sustainable are dividend yields from European companies? Very. As with U.S. companies, strong balance sheets coupled with cautious plans for capital expenditure has led to unprecedented levels of cash being hoarded by European companies: in excess of €800 billion. With such a cushion of liquidity, both dependable and rising dividend payouts are possible from the strongest companies. The yield offered by continental European companies is highly attractive. 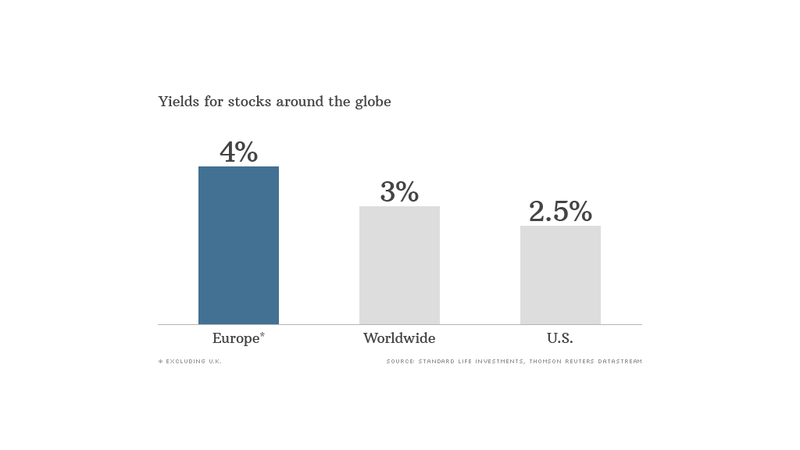 The European (ex-U.K.) stock market currently offers a yield of approximately 4%, compared with 2.5% from U.S. equities and 3.0% from global equities overall. Based on historic price/earnings ratios -- and despite recent market rallies -- European markets continue to trade at valuation discounts to both the U.S. market and the rest of the world. The high yield from European stocks is not coming with an overvalued price tag. Still, with current talk of "currency wars", should investors be concerned about the impact of a stronger euro? The euro has been one of the strongest performing currencies in 2013, and every 10% rise in the euro cuts European earnings by approximately 3%-4%. However, currencies are always volatile and making long-term investment decisions based on short-term moves is perhaps not the wisest course. So investors considering markets in an open minded manner may be pleasantly surprised by what they find in Europe. Leading European companies offer sustainable and rising yields together with the prospect for capital gains. We believe that makes them a compelling proposition. Ross McSkimming is International Equities Investment Director at Standard Life Investments, a global asset manager headquartered in Edinburgh and Boston. Note: All information, opinions and estimates in this document are those of Standard Life Investments, and constitute our best judgment as of the date indicated and does not constitute investment advice.